When most people endeavour to come to South Africa,generally a trip to Cape Town and a wild life safari suffice for them to say that they have seen South Africa. We’re here to say that there is more to this African nation then this. Including other cities such as Johannesburg, Port Elizabeth and Durban, it’s the latter – including a few things that you can do while you are here that we are going to look at in this blog. A few activities that you can entertain yourself with while in Durban include. Recently Durban has improved its beachfront area by connecting Ushaka Marine World theme park to white kettle shaped Moses Mabhida World Cup Stadium. Starting near the stadium is a wonderful network of scenic bike paths that allow visitors to enjoy a sea side bicycle ride. There are also varied opportunities to surf, swim, walk, and SUP Paddle. On the first Friday of each month a mass cycling event is put on by Critical Mass. It is now possible to enjoy a 3 hour long cycle ride along Durban’s newly restorated beachfront area. Durban established Indian population has developed a unique local dish called bunny chow. Also often just called a “bunny” this dish is a half loaf of bread that is hollowed out and filled with chicken, mutton, or vegetable curry. A nice place to try this regional dish is a restaurant called Goundens. Always savory and filling eating a bunny will give you a taste of Durban. While in Durban it is possible to pay tribute to both Nelson Mandella and a lesser known, though greatly important local revolutionary, M.K. Gandhi Mand. Back in 1994 Mandela delivered his first vote for an elected leader of South Africa at Ohalangee High School – the first school built for black South Africans. There is a statue outside this school now that commerates Mandela and this moment. M.K Gandhi (check if this is Gandhi from India???) used his position as a lawyer and activist to fight against apartheid. 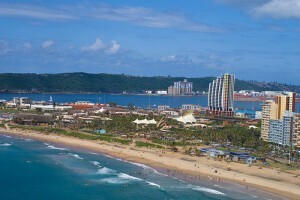 During a trip to Durban its advised to definitely eat braaing – or barbeque – in South Africa. There is wonderful meat to be had and eating it can be combined with a tour of one of Durban’s townships. Inside the townships, though perhaps materially disadvantaged, the people are still filled with life and enthusiasm. Barbeques become huge social events were people eat communally with cooked meat placed on a wooden board along with chilies, tomatoes and cooked maize meal. People grab and eat with their hands together as a group.